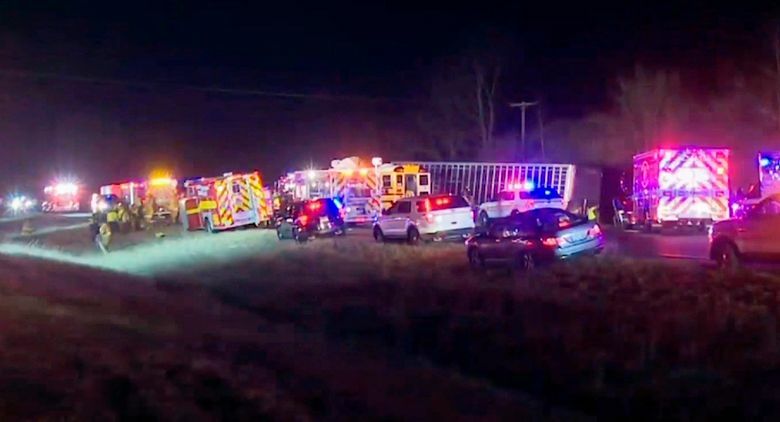 DOWNS, Ill. (AP) — A semitrailer heading the wrong way on an interstate crashed into a school bus carrying an Illinois high school girls’ basketball team, killing the truck driver and an adult on the bus, authorities said Thursday. 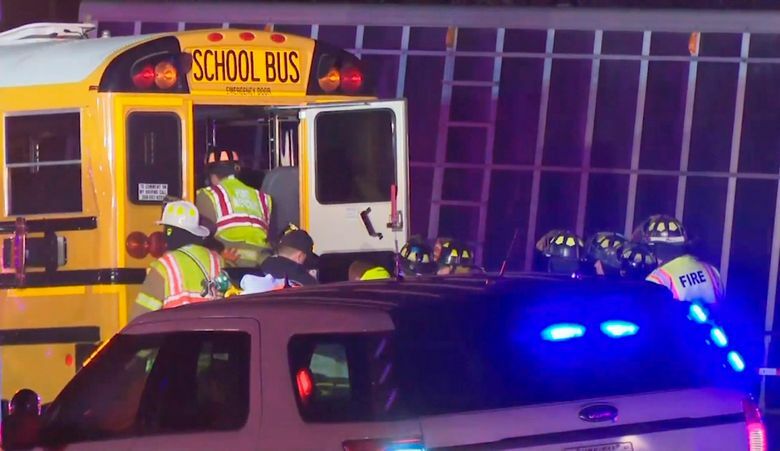 Illinois State Police said eight girls were injured when the truck collided head-on with their bus Wednesday night along Interstate 74 near Downs, a village in central Illinois about 115 miles (185 kilometers) southwest of Chicago. Police said the bus driver and a coach also were injured. Normal West High School Principal Dave Johnson said five girls had been treated and released from the hospital as of mid-morning Thursday. Police said none of the girls’ injuries was considered life threatening. Johnson said the coach, Steve Price, suffered “multiple broken bones that will require surgery,” but that he was also expected to recover. Johnson said he didn’t know the condition of the bus driver. Police identified the bus passenger who died as 72-year-old Charles Crabtree, a volunteer with the high school. Preliminary reports indicate the truck driver, identified by the Peoria County Coroner as Ryan E. Hute, 34, of Delmar, Iowa, was traveling eastbound in the westbound lanes, authorities said. The westbound lanes were closed following the crash. The girls’ team was returning from a game at Champaign Central, Normal West athletic director Stan Lewis told The (Bloomington) Pantagraph. Lewis said the bus was carrying the school’s freshman team and some members of the junior varsity team. Parents and friends of the injured students gathered at the school for updates as word of the crash spread on social media. “People care about each other in this school and this community, and I think they just wanted to be together during this horrible tragedy,” Brown said. The school opened Thursday with counselors on hand, said Dayna Brown, a spokeswoman for the McLean County Unit 5 school district. The girls’ varsity team also voted to play their scheduled Thursday night game, Johnson said.